Founder of Sea Turtles 911 and the World Conservation Union’s (IUCN) Marine Turtle Specialist, Frederick Yeh, applauded Yao’s conservation efforts to educate the public. 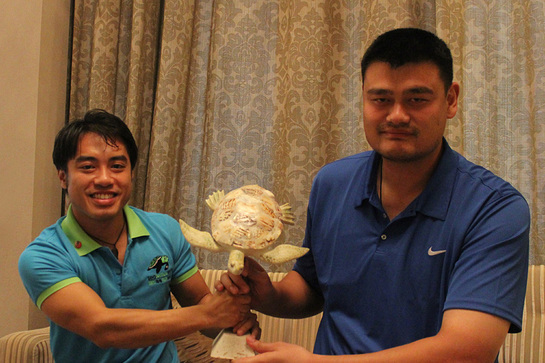 “With his superb knowledge in sea turtle conservation, Yao Ming gives an epic voice to save our marine wildlife for future generations,” said Yeh, as he presented Yao with the World Sea Turtle Conservation Award. Earlier this year, Yao Ming and his family joined Sea Turtles 911 to release rescued marine turtles back to their ocean home, setting a good example as a father and public role model. Yao Ming has consistently ranked #1 on the Forbes China Celebrity 100 list, and thus his public influence in raising awareness for sea turtle conservation is critical, as China remains the top consumer of endangered turtles worldwide. While sea turtles are iconic species in the ocean environment, the 2.29 meter (7-feet-6) tall NBA superstar turned environmentalist Yao Ming is a national icon in China. Yao’s repeated support for saving marine turtles this year represents China’s growing concern for the marine environment.